Here’s a quick look at the latest news from APTE and around ACC. You are invited to APTE’s Fall General Membership Meeting! Please RSVP by Nov 1st, for lunch count, RSVP. To support the student pantry’s on campuses, please bring a non-perishable item with easy to open lids (grab & go items like microwaveable mac & cheese, soups, snack items such as breakfast bars etc) Live streaming will be set up as well! Today, October 31st is the last day to contribute to SECC! Each year, ACC employees contribute thousands of dollars to help others in need. Reminder to RSVP by Nov 2nd Settlement Home Tour– APTE members have been invited on a tour to learn more about The Settlement Home for Children, and how we can help out. Enjoy a complimentary lunch, tour the campus and learn about the work being done to help children heal and grow. Learn more about the mission and sign up for the tour. State Employee Charitable Campaign – Each year, ACC employees contribute thousands of dollars to help others in need. This year’s SECC continues through October 31st. If you haven’t heard or seen, APTE has service t-shirts. The t-shirt was designed with pride to wear when participating in community service events or projects, community service looks good on you! Opportunities to win or purchase a t-shirt, coming soon! Settlement Home Tour – APTE members have been invited on a tour to learn more about The Settlement Home for Children, and how we can help out. Enjoy a complimentary lunch, tour the campus and learn about the work being done to help children heal and grow. Learn more about the mission and sign up for the tour. 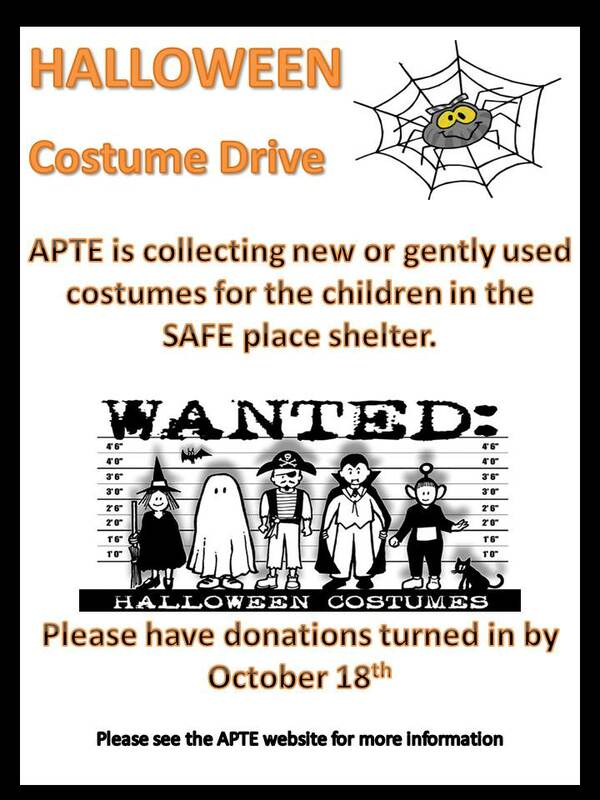 Please consider donating new or gently used Halloween costumes to the Costume Drive. This service project benefits the local Safe Place Austin (a local shelter). They have many youths ages 5-17 who would love a Halloween costume. Other items to donate could include face paint, candy buckets, and candy! A donation box will also be placed at each campus. Lots of updates to share below, cheers! I reported on the latest from APTE at last night’s BOT meeting and stayed for the budget discussion and vote. On behalf of all the APTE officers, I share in the sentiments below from our AFT Prof-Tech VP, Daniel Ohanlon. As VP of Proftech of the ACCAFT Loca 6249, I am pleased to report to you that the ACC Board of Trustees voted and passed the 2018 budget this evening. The budget DOES include a 3% raise for employees. Additionally, the Board also passed the new “living wage” of $15.00/hr. As well, there were a series of positions which will receive market adjustments. Details can be found on pages 72-32 of the Board agenda. The union is pleased with our efforts in conjunction with the internal association efforts. We look forward to a new year and new challenges before us. As always, I am available to speak to the officers and members at any meeting, so we can work together to ensure that APTE members are represented in all aspects of the College appropriately, fairly, and honestly. In addition, several adjunct professors, including AFA President, Vanessa Faz, spoke on the inequity of adjunct pay. I share this information with you in the hope that APTE members support our fellow ACC employees in making sure that pay raises are equal for all. I wanted to say a huge THANKS to everyone involved in the APTE BBQ Celebration last week. Thanks to the hard work of the event planners and our zero waste volunteers, more than 99% of waste was diverted from the landfill! Give yourselves a pat on the pack, this is great news! Please feel free to share this success story with others and encourage them to make their next event zero waste. Thanks again. I hope to see you all again soon at another Zero Waste event. 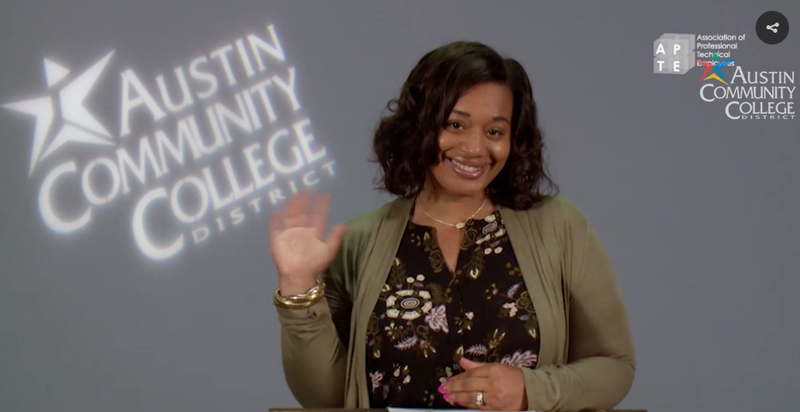 For those still pondering or might be interested in presenting at SXSW-EDU or SXSW next year, there will be a meet-up in Austin next week. There are alsomeet-ups in other cities if you happen to find yourself there on vacation. The meet-ups are free and provide you with information and the opportunity to get all your questions answered. By the way, the panel picker process is open and proposals are due (including intro video) July 21. Good luck and I hope to see some great ACC presenters next year. A link to instructions for adding comments appears ​near the top of the page. The deadline for comments is July 31, 2017. Please communicate this information to your members.